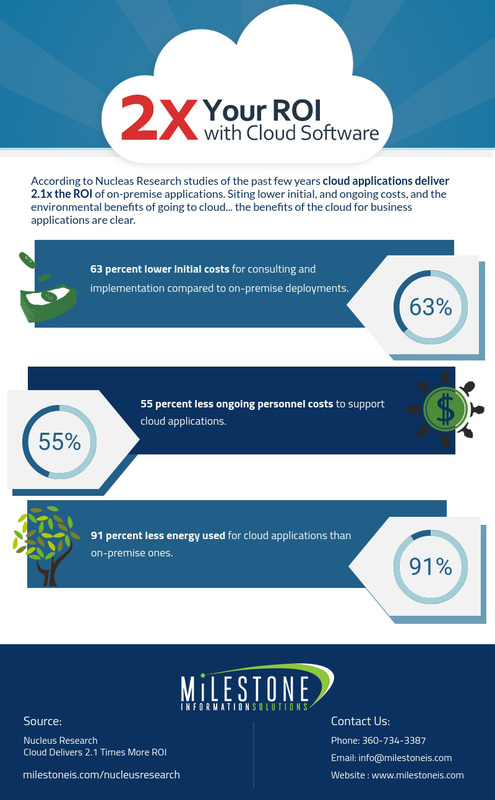 If you’re researching whether to switch from on-premises business software to the cloud—the Whitepaper Cloud Delivers 2.1 Times More ROI released by Nucleus Research highlights some of the ways cloud saves money. Cloud software ROI is 2.1 times higher than on-premise. First, they note that cloud software projects deliver 2.1x times the relative return on investment (ROI) of on-premises projects. That’s up 24% since their 2012 analysis, which marked the difference at 1.7x times. This means that all the great features of cloud software—adaptability, scalability, integration, and customization, and lower initial startup costs and maintenance—are still true and are a huge contributing factor to cloud software ROI. Cloud Delivers 2.1 Times More ROI points out two main numbers that should make everyone researching business software sit up and pay attention. Why are the savings so significant? Cloud software is designed for agility and seamlessly integration with your business. The Whitepaper from Nucleas also points out, that if something goes wrong, the vendor for the cloud application has to fix things. And they have to fix it all the way, not just “good enough to keep working”…It’s also a good idea to find a VAR (software vendor or partner) you can trust. It prevents the likelihood to “cut and run”—asNucleus puts it—in the first six months. Even if the investment isn’t as large upfront, it is still worth seeing through to the end. Save yourself the hassle of switching from a less than satisfactory vendor by doing some additional research on the front end and finding a partner who really understands the needs of your business. Milestone has been partnering with Pacific Northwest businesses for over 20 years, give us a call (360-734-3387 or go to our contact page) and let’s find out if we would be a good fit as your ERP implementation partner. A final number to consider is that cloud software uses an average of 91% less energy than on-premises. That’s great for your budget and the environment! ​These, and more provide overwhelming proof that “it’s hard to argue against the cloud.” For more details and analysis, read the whole whitepaper about how cloud software ROI out plays on-premise time and again.